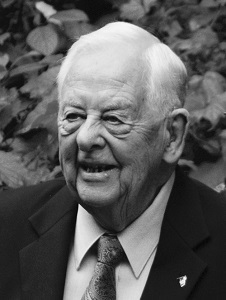 Doug graduated in 1944 in Chemical Engineering from Queen's. He was the first in his family to graduate from university. Upon graduation he started to work for Canadian Hanson & Van Winkle Ltd. in the electroplating business, first as Chief Chemist and then into sales and senior executive positions. Doug regaled his four children with stories of life at Queen's. Although his children attended other universities, the grandchildren heard the same stories of how great his experience at Queen's had been. Doug was thrilled when five of his 9 grandchildren attended Queen's in a variety of disciplines - science, geology, medicine and law. Two grandchildren-in-law also are Queen's grads. Doug attended many Science '44 reunions and stayed close friends with several classmates, including some who attended Doug's 90th birthday celebration held at the Pub at the Donald Gordon Conference Centre in August 2011. Queen's Engineering provided a young man raised on a farm the opportunity to acquire knowledge and skills that set him on a successful business career and provided him a rich social life and life long friendships. To celebrate Doug's memory, his family is asking that gifts be made to the Faculty of Engineering and Applied Science Dean's Excellence Fund. Please be sure to fill out the commemorative portion of the form entitled "Dedicate my gift to Doug Hanna." This will allow Queen's to notify Doug's family of your thoughtful donation to the Faculty of Engineering and Applied Science Dean's Excellence Fund.